« GCC: Subbing 2.0: How much? It’s full of fun garments ranging in size from one to ten years. 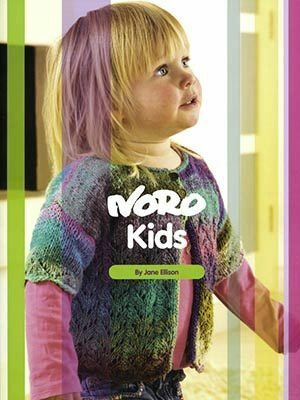 The great thing about Noro patterns is that they are usually very simplistic, with a goal to show off the yarn as best it can. Jane has added some great tutorials on tension, sizing, joining new skeins, grafting, finishing techniques, and much more to help you along the way. 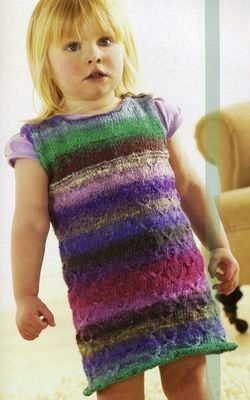 This simple dress called Eva is made in Noro Aya, with a composition of cotton, silk, and wool. Dresses like this these are great on their own for the Summer, and in the Winter you can pair them with a long sleeved under shirt and some funky leggings! Amy is a fast and simple cardi which can be embellished with a wooden heart button, like in the picture. 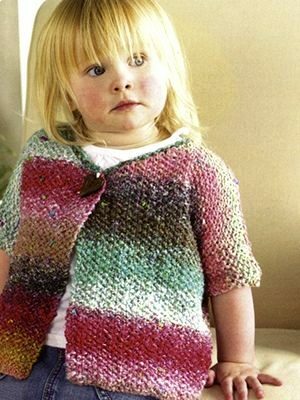 The cardi takes 3-5 balls of Noro Furin, a chunky weight yarn knit on 7mm needles. The fun thing about knitting with Noro yarns, is that it keeps your interest as you’re always thinking about which colour is coming next! If you haven’t tried knitting with Noro Taiyo yet, why not try it out on this warm stripey blanket. The Little Blanket takes 3 balls of Taiyo on a 5mm needle. This book is currently only in the Point Grey location, but will make it’s way to Edgemont by next Thursday. If you’re into glitz and sparkles, you’re in luck as this week we have Estelle Dazzle on special at 50% off! This is a great ladder yarn used for making scarves and shawls. We have four fun and bright colours to chose from, but quantities are limited, so get it while you can. And remember we’re still getting lots of great new items in every day. Watch for more Shibui on next weeks blog post! This entry was posted on Thursday, April 15th, 2010 at 2:18 pm	and is filed under Uncategorized. You can follow any responses to this entry through the RSS 2.0 feed. Both comments and pings are currently closed.